Strangely, caravan underfloor heating isn’t something that’s all that common, the preferred options generally being a blown-air system or a ‘wet’ system with radiators much akin to your central heating system at home. Firstly, although forcing warm air around a caravan is an easy way to warm it up quickly, the resulting warmth is a dry warmth, which we’ve experienced in many a rented ski apartment, and don’t really like! Secondly, while the rapid heating does mean you don’t have to leave the heating running overnight, if you don’t, it will get a bit chilly in the mornings, unless you install the system with a timer. If you do leave the system on overnight, you’ve got the constant drone of the fan, even if as in some installations, it’s installed under the floor of the caravan. Finally, blown air systems do include quite a lot of pipework / ducting running around the van. Obviously this will generally be situated under the floors of lockers, seating units etc, but does take up valuable storage space, which is somewhat at a premium in a relatively small caravan. Firstly, the aluminium-finned radiators are pretty efficient, but you will need quite a lot of them to generate the heat you need. The view of another new Airstream owner with the Alde Compact system fitted, was that you really should have as many as you could possibly fit in, as they found that on occasions in the winter months, the standard fit system on new Airstreams did need supplementing with a fan heater or something. As we are planning to use our trailer for ski holidays, coping with fairly extreme temperatures had to be a must. So, we’ve got lots of radiators to fit in, which brings us to the next problem, of the space they take up. Since cold air needs to pass over them to get warmed, they need to be situated along the walls of the caravan in narrow cabinets which have vents at the top, and corresponding intake vents at floor level (again generally underneath the floors of seating lockers) where the cold air can enter. The recommended minimum depth of these radiator cabinets is 250mm, so effectively you’re losing 250mm of interior space for seating unit that has a radiator cabinet behind it. Another consideration is that of where the boiler itself can be installed, as since it can be run on gas, there are various rules and regulations about where it cannot be situated – for instance, not directly under or within a certain distance of a window. So as a vintage 1956 Airstream Safari has LOTS of windows, you’re a bit restricted as to where to site the boiler. Finally, weight. Certainly the radiators are super light in weight, but you’ve then got to add all the pipework for the system, as well as the boiler itself, so it’s easy for the weight of the trailer to mount up. In spite of these negatives though, we would probably have gone for the Alde Compact system, as it does provide good heat and a plentiful supply of hot water. However, having taken the decision not to have a shower in the trailer, this was probably a luxury we didn’t need, and therefore not worth paying the weight (and cost) penalty. It’s also a bit “normal”, and not desperately ground-breaking, since lots of people have already done it! Hence, underfloor heating, which is silent (so can be left on all the time), unobtrusive once installed, lightweight (although obviously there’ll be some extra weight due to needing a separate water heater), controllable via a thermostat – and produces a lovely type of cosy heat, so warm toes in the mornings! It is also a lot more EXCITING!! The only question really is whether you can fit enough of it in there to provide sufficient heat! As we described in a previous post though, adequate insulation plays a big part in how much heating capacity you need, so with a good thick layer of Celotex closed-cell insulation underneath the floor, and both Thinsulate and Airtek bubble insulation between the internal and external skin, we’re hoping to keep heat loss to a minimum. 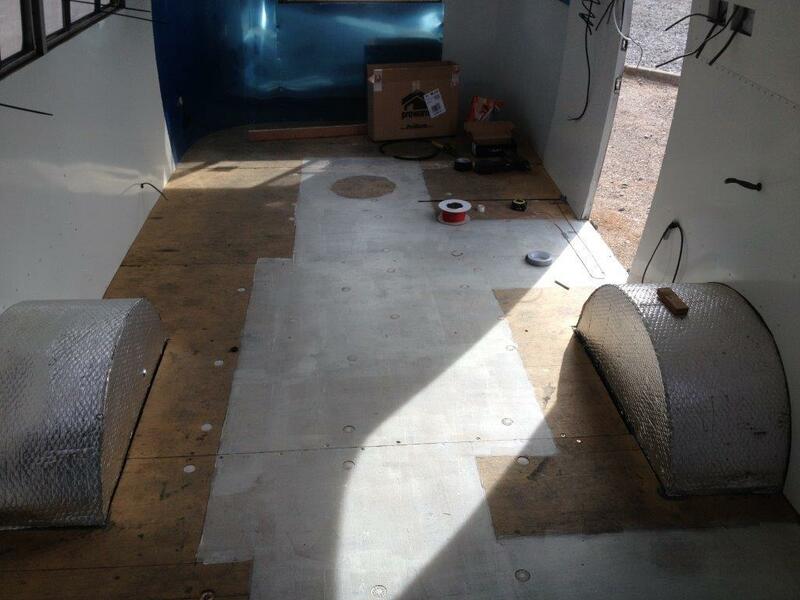 In order to get as much heating capacity in the trailer though, we also decided to go for underfloor heating wires rather than the more commonly-used heating pads. These are somewhat thicker than the pads, but allow greater flexibility in terms of fitting them around seating areas / cupboards etc, whereas the pads tend to be in fixed shapes and sizes. The photo below illustrates how we have used this to get the maximum length of heating wires on the floor, by fitting round obstacles such as the table leg, seating areas and the bathroom, where we have fitted some wires though, as nobody likes a cold bathroom! 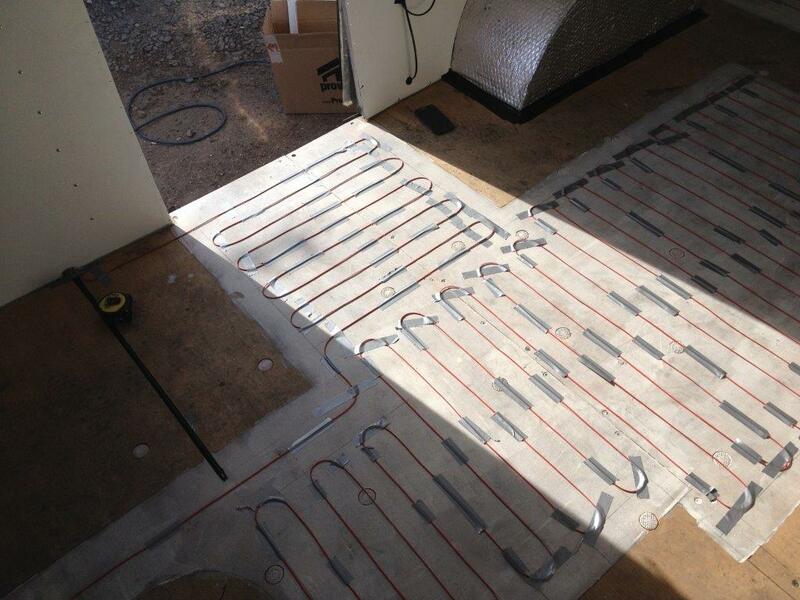 Underfloor heating wires give more flexibility for fitting round rooms and furniture than heating pads.